KEARNEY – There was a festive feeling at the Alpha Omicron Pi house on the University of Nebraska at Kearney campus. With a fresh layer of snow on the ground outside and twinkling decorations, hot chocolate and cheerful music inside, it was hard to not be in a joyous mood. Members of the UNK sorority hope to share that spirit with U.S. military members serving overseas through an annual event held Thursday evening. 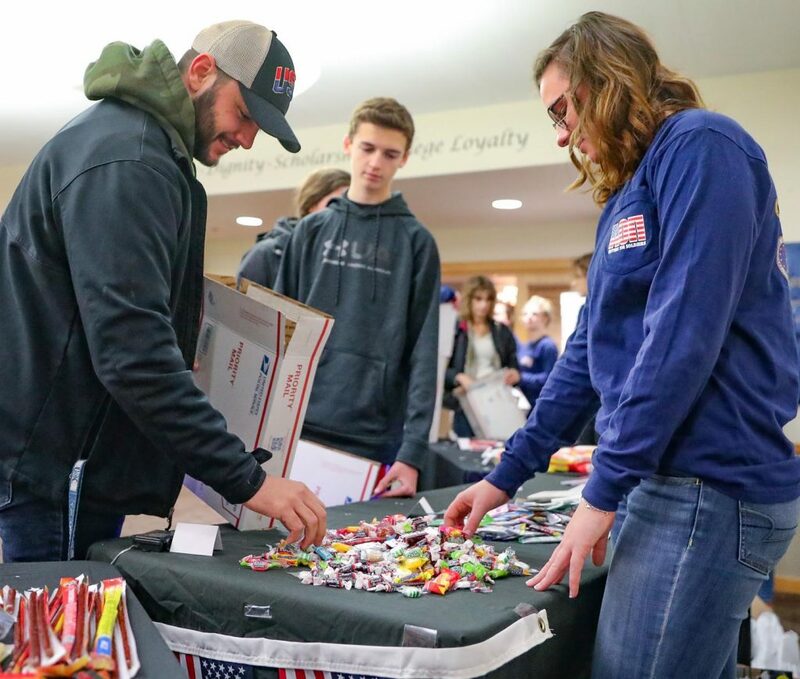 Sisters for Soldiers, an Alpha Omicron Pi project the UNK chapter joined in 2013, creates care packages for service men and women who will spend the holidays away from their families. “It’s a little something to show that we’re supporting them and thank them for their service,” said Cassie Kenedy, a junior from Omaha and philanthropy chair for the sorority. 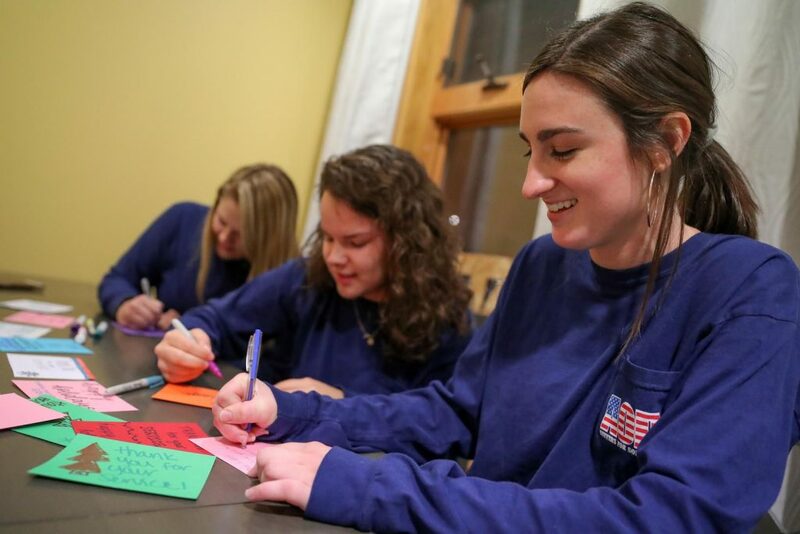 Alpha Omicron Pi members spent a few weeks collecting donations, and Thursday they invited the campus and Kearney communities to their house to help prepare the gifts for shipment. In one room, tables were covered with playing cards, puzzle books, DVDs, toiletries, snack foods and other items ready to be boxed up. In another, there were supplies to create colorful cards and write messages for the care package recipients. A group of fourth-grade students from Elm Creek Elementary School also contributed handmade cards to the project. 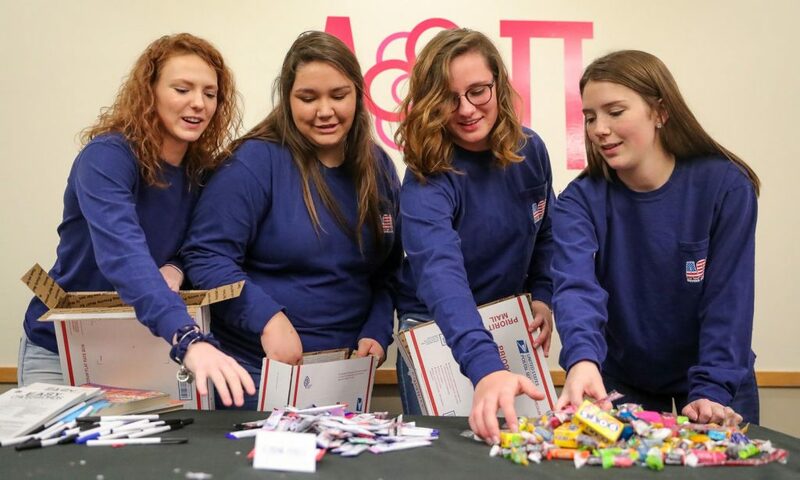 The sorority will prepare and ship about 230 care packages, each containing a group photo of the chapter members. 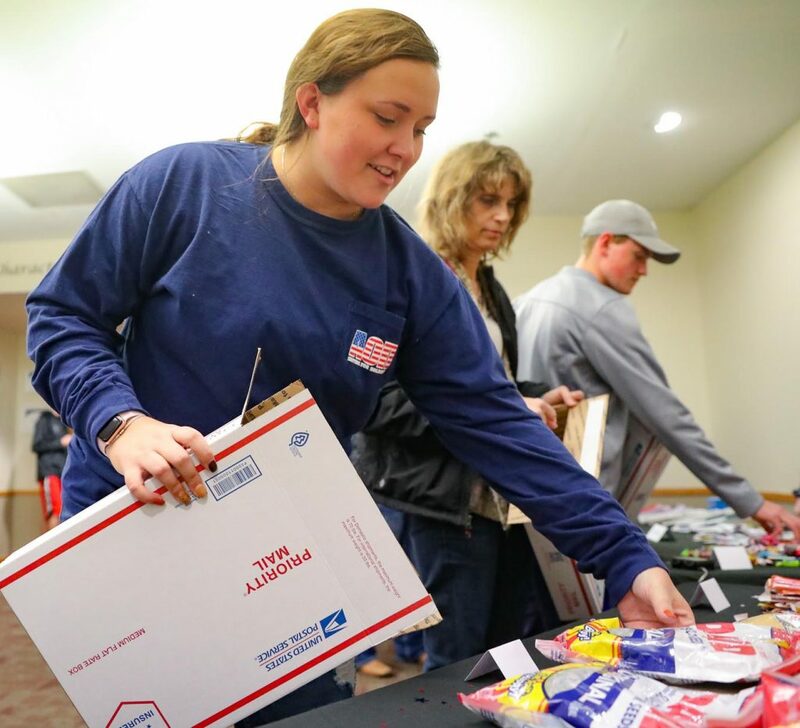 Some will be sent to specific armed forces members and others go to Soldiers’ Angels, a Texas-based nonprofit that will forward the boxes to overseas military bases. Alpha Omicron Pi member Jessi Vasquez, a sophomore from Kearney, said it’s “really cool” to be part of such an impactful project. For some sorority members, Sisters for Soldiers means even more.